Microwave spaghetti squash for 3 minutes to soften. Slice spaghetti squash in half vertically through the root end, then place both halves face down on a foil-lined baking sheet. Roast for 45 minutes until flesh is soft. Remove from oven and let cool slightly. Heat oil in large sauté pan on medium-high heat. Add garlic and cherry tomatoes; cook 2-3 minutes, without getting the tomatoes too mushy. Cover and keep warm until spaghetti squash is ready. 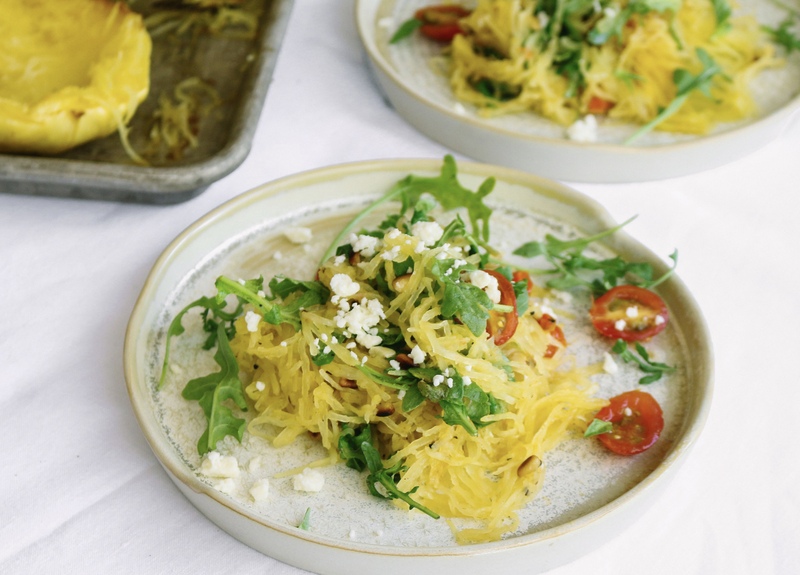 When the squash is cool to the touch, use a fork to shred it into long spaghetti-like strands, then add the warm squash “noodles” to the tomato mixture. Turn burner back on low, then add arugula, cheese, a drizzle of olive oil, and a liberal pinch of salt and pepper. Toss to combine, then remove from heat. Add the basil and pine nuts, lightly toss and enjoy!